These frozen white chocolate strawberry pops are easy for kids to make. They are perfect for a party or enjoy one as a treat on a sunny afternoon. Time: 20 minutes plus 2 hours freezing time. 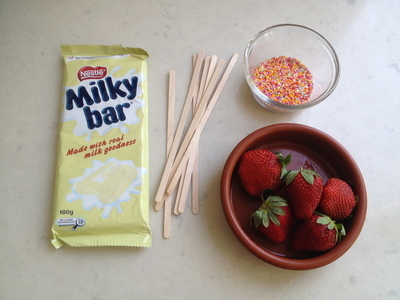 Push a coffee stirrer stick into the base of the strawberry slice. 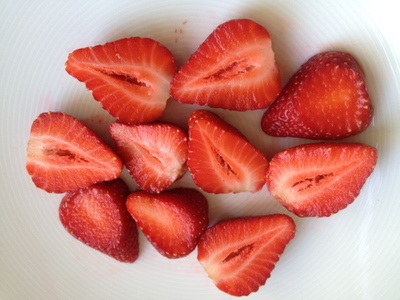 Repeat with all of the other strawberry slices and sticks. Freeze the strawberry slices on sticks for 2 hours. Remove from the freezer just before starting to melt the chocolate. Break the white chocolate into chunks and hear gently in the microwave to melt, stirring regularly and stopping as soon as the chocolate has just melted. Be sure not to overheat. Add a dash of olive oil to the melted chocolate and stir in. Coat each frozen strawberry in the melted white chocolate. It will solidify quickly so you will have to work fast. 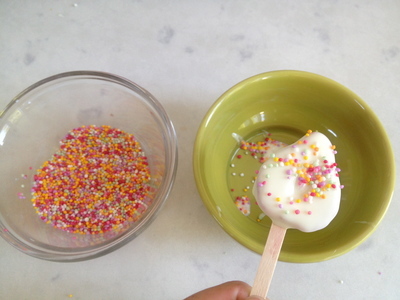 Add some colourful sprinkles before the chocolate fully sets. Return to the freezer until you are ready to serve.